A typical scene with a small two track road, set very close to the cottage. 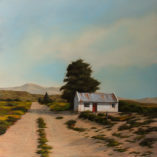 These workers cottages are very common on farms throughout the Karoo and are always a favourite with Donna and her work. Wuppertal is a small town in the Cederberg mountains in the Western Cape province of South Africa. Wuppertal was founded in 1830 by two German preachers of the Rhenish Missionary Society, Theobald von Wurmb and Johann Gottlieb Leipoldt, grandfather of C. Louis Leipoldt. In 1965, after the Rhenish Mission had slowly scaled down their actions in Southern Africa over a period of 40 years, a choice was made that Wupperthal in future should become part of the Moravian Church. As a result, by that stage it had made the change from a mission to an self-ruling church in South Africa. The town remains a Moravian mission station to this day. The village remains remote, and is reached by a gravel road from Clanwilliam over the Pakhuis Pass. Public facilities also include a shop, a tea room, a post office, a school with two hostels and a public hall. Most folks in the area are reliant on small-scale farming or livestock for their living. The most central cash crop is rooibos tea and the hilly areas nearby the village provide grazing for goats. In its heyday the shoe workshop, founded by Johann Leipoldt himself, provided work for many skilled craftsmen. The Wupperthal handsewn veldskoen (old-style soft suede shoes) were for nearly a century famous across South Africa for their comfort and good craftsmanship. A tannery and a glove factory were also in process for many years. The shoe workshop is still going today, but runs on a much smaller scale. In September the barren mountain slopes become covered in flowers for a few weeks.